It has been suggested that this article be merged with Fast & Furious (2009 film)#Home video. (Discuss) Proposed since March 2018. Los Bandoleros (Spanish for The Outlaws) is a 2009 American short film directed, co-written, and co-produced by Vin Diesel. It is the second short film in The Fast and the Furious franchise, and stars Diesel, Michelle Rodriguez, Sung Kang, Tego Calderón and Don Omar. 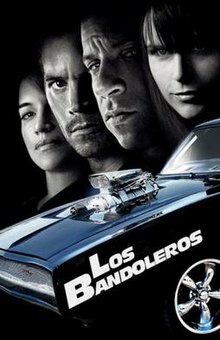 Los Bandoleros details the events prior to Fast & Furious where runaway fugitive Dominic Toretto plots to steal oil from a tanker in the Dominican Republic. It was released on July 28, 2009. It was later included as a bonus on the Blu-ray and Special Edition home releases of Fast & Furious. Paul Walker and Jordana Brewster both appear on the poster, but are not in the film. Leo Tego is imprisoned in the Dominican Republic, and engages in a debate with other prisoners regarding corporations holding back the electric car and starting wars for oil. Rico Santos, meanwhile, encounters difficulty in locating gas in order to get home on time for dinner. Han Lue later arrives, and is collected from the airport by Cara and Malo. They drive him back to Rico's house, where his aunt Rubia is struggling to keep up with her gas bills. Han goes outside to see Dominic Toretto working on his car, before they both go inside to enjoy a meal with the entire family. Dominic discusses breaking Leo out of prison and stealing oil to support the family. Dominic, Cara, and Han later head to a nightclub to meet with corrupt local politician Elvis, who is able to arrange for the robbery to take place on a highway the following morning. After managing to break Leo out of prison and finalizing the plan with Rico, Dominic is surprised by the arrival of Letty Ortiz. The two drive together to a beach, and rekindle their romance. Vin Diesel as Dominic Toretto, a runaway fugitive hiding in the Dominican Republic who plots to steal oil. Michelle Rodriguez as Letty Ortiz, Dom's love interest and an associate in the heist. Sung Kang as Han Lue, a criminal associate of Dom who aids him in the oil heist. Tego Calderón as Leo Tego, an escaped inmate who works with Dom to steal the oil. Don Omar as Rico Santos, a member of Dom's crew and shelters Dom from law enforcement. The central cast is rounded out by appearances from Juan Fernandez as Elvis, a corrupt politician. Mirtha Michelle and Valentino Morales act as Cara and Malo respectively, friends of Dominic and Rico. Adria Carrasco also appears as Rubia, Rico's aunt. ^ "Vin Diesel "adores" Dominicans, presents 'Los Bandoleros'". dominicantoday.com. Archived from the original on 7 December 2014. Retrieved 19 May 2011. This page was last edited on 23 February 2019, at 17:18 (UTC).